who then contacts the State TEAM Leader. This then expands on upward to a Region. as in in the example of some single nodes. but rather upon WHO you know. to protect them in any case. Survival will depend upon WHAT you know. WHAT the SAFE System does. like most people presently imagine. Survival will depend upon HOW you can reach others who have prepared and who understand the SAFE System. 2. Know WHAT to contact them about. 3. Know HOW to contact them. In a developing crisis, when all media is down or does not have any current on-the-ground action reports and all you know then is what you can see & hear from your front porch, wouldn't it be great to have an ear to what's really going on, on the ground, over there?!? That's where your shortwave radio pulls in all the breaking action from independent eye witness sources up close and in the thick of it!! Everytime there's been a big disaster, it is always the hams with their radios getting the first word out to everyone else outside! Being tuned in to them then is like being the only guy with a flashlight in a black out, to really know what's going on outside of you immediate range of sight and hearing! Below is a list of some inexpensive radios and where you can get them and also the frequencies you'll want to write out and tape onto your rig. 1. Store enough supplies for your family. 2. Be prepared to defend your stored supplies. and don't let them know about your preparations. that you 'already know' are proven and true. 5. Communicate on a 'one way basis'. 1. You can never store enough. in obtaining and rationing existing stores. 3. Cooperate with others in providing community security. 4. Cooperate in producing new supplies. The purpose of SAFE is to prepare people to respond in their local communities in case of some Major Catastrophe. The primary focus of Ark Two is nuclear WW3 - but it could be a MAJOR catastrophe from any cause. Take your pick. The SAFE Ham Net will provide communication necessary to help obtain the primary necessities - plus to provide contact with the outside world when perhaps none other means of communication will exist. It could then also provide general news, weather, information about recovery techniques, and contact to family in remote locations. We speak of the SAFE 'community', rather than 'organization'. Because SAFE is independently and locally structured, it is a 'community' rather than an 'organization'. The intent is that the SAFE Community function from the 'bottom up' rather than from the 'top down' - although at the present - this has not yet occurred- so people are being introduced to SAFE by the 'top down' Ark Two structure. The Ark Two dream is to have before the time of the catastrophe at least one SAFE Community in each US and Canadian county. There are over 3,000 US counties. Ideally there would be 10 SAFE Net Hams in each county - which would be supporting at least ten times that number of members - and cummulatively that would be three hundred thousand SAFE members in the US, including the 30,000 SAFE Hams. What a dream! We are very fortunate to have residing in the willage where Ark Two is located - FOUR licensed Hams who are members of Ark Two - and two of them hold the Advanced license. Greg is the Ark Two Ham TEAM Leader. Also - in Ham terms, my Elmer and our Ham guru. We feel that the view here in the village, from Greg's Ham Shack, should be the envy of city dwellers - but I am not sure, given the difficulty that I have in getting people to move out of the city. 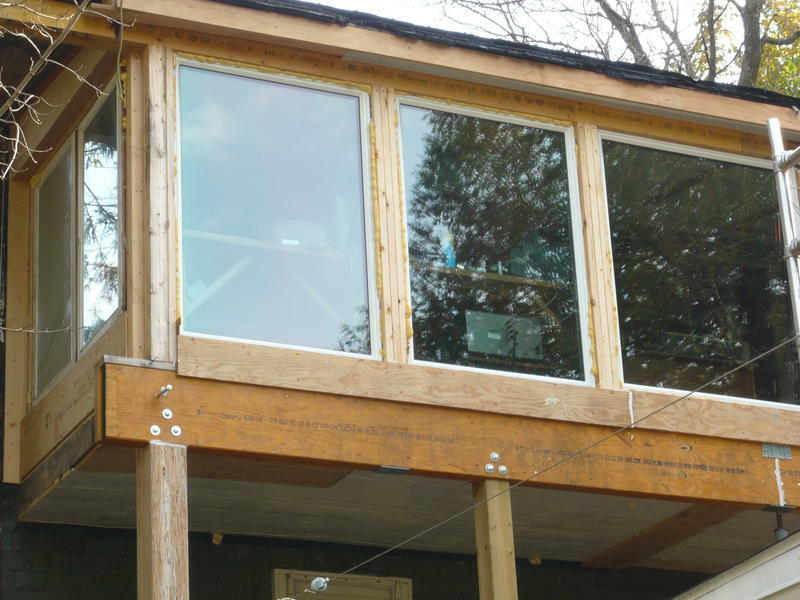 This is Greg's Ham Shack from the outside - and is from where we conduct our monthly over the air Ark Two / SAFE Ham get-togethers. When Ark Two goes into crisis mode we will be using the shelter location which is located on one of the highest points in Southern Ontario. There we have powerful diesel generators for power and a tower from which to beam our signal down over the US. When There Are So Many??? Ham communications have always been beneficial in times of disaster when other means of communication fail because of the destruction of the social infrastructure - or the lack of electrical power. These failing factors would be manifest in a manifold way in the type of catastrophe for which the SAFE Ham net is being developed. The scale of catastrophe for which the SAFE Ham Net is being developed would even swamp all current Ham organizations, none of which are designed for a catastrophe of this scale. That is why the SAFE Community needs its own specifically designed Ham Net. Through the SAFE Ham Net the members of the SAFE Community could be informed of the extent of catastrophe - and the situation in other locales at a time when the information would not be available from elsewhere. This could be especially valuable in regards to coordination of the existential matter of obtainng supplies - and regarding local threats / surrounding security problems. It could also provide information regarding the situation of family - in distant places. In the collapse of conventional means of communication such basic information as weather forecasting and road conditions and general news of what is happening may well be available only through this source. Those who are committed to the SAFE principles of preparation for survival will be aware that Ham equipment will be one of the most valuable tools which they can have for survival. 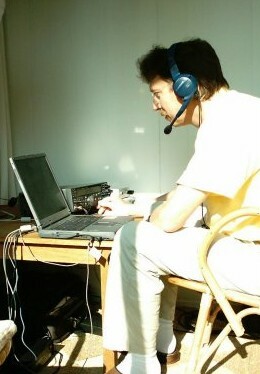 Any Ham operator, with a full blown Ham transceiver, and a computer - can become a member of the SAFE Ham net - without obtaining any additional equipment. Many Hams wish to experiment with all sorts of things. For many the goal is to contact ONE TIME as many different other Hams as they can and at as great a distance as they can. Others like to be able to contact ships at sea, use satellites, bounce signals off the moon or passing airplanes, or meteors, or lightening or whatever. Some like to send pictures, TV or other 'exotic' signals. Morse Code was an important part of Ham practice at one time - and some still practice it. Much, indeed perhaps most, Ham communication is simply a matter of sending their call signals back and forth along with information about the strength of the signal and the type of equipment being used. Except in time of emergencies - I would estimate that over 99 percent of Ham communications do not contain any information of importance or relevance. In fact - in is written into the law that governs Ham operations - that is to be the case. Sadly, most Hams are no more prepared for sociatal collapse than is the general public - and most often they think that the idea of preparing is just as ridiculous as does the rest of the public. Consequently, they haven't made the special preparations that they need to for their rigs. Moreover, they are totally unaware of the special types of services that will be needed or how to fit in with them, even if they should manage to get onto the air. The goal of most then, as is the goal of most people now, will be to simply look out for themselves. a. Very low cost so as to be affordable by a great number of participants. b. Extreme simplicity to assure usefulness rather than hobbyist involvement. c. High reliability regarding ability of repeated contact with desired stations. d. Dependability that the system will work under the extreme conditions for which we are preparing. 1. We are developing a means to protect the SAFE Ham Net equipment from EMP. in case the user's host computer is affected. 3. We are providing very simplified operating instructions. 4. We are sourcing equipment specifically designed for our application. 5. We have a budget target of $200 for the transceiver equipment. What will be described here is a system that any SAFE member can obtain - and use to listen in at any time - without a Ham license. At the time of the Catastrophe there will be no restrictions on their using the equipment to contact the other members. Of course - if they desire to use the equipment ahead of time for transmitting - for practice and to get experience - they will need to get a HAM license. As people get the equipment, for those who express an interest in getting a Ham license - I will explain a much simplified method for doing so - over what has been involved in the past. Yes, it would be good to get a license - and to practice using the equipment ahead of time, but that is not nearly so important as having the equipment available. The transceiver in the top right adjoining picture operates on only one band. If you wish to monitor more bands then you can supplement your transceiver with a stand-alone shortwave receiver like the one in the bottom right adjoining picture. 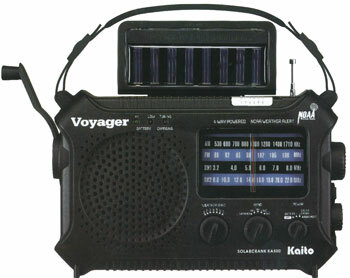 There are available for less than $100 many emergency AM/FM/SW receivers like the Kaito KA-500 Voyager on the right. There are five ways to power the pictured receiver: (1) dynamo (wind-up) cranking, (2) three "AA" cells, (3) built-in Ni-MH battery pack (4) solar panel which powers the radios internal batteries (5) or an optional AC adapter. UNFORTUNATELY the pictured receiver does not receive the SSB (Single Side Band) that Hams use. For about the same amount of money you can find one that does. You can also buy stand alone shortwave receivers for hundreds of even thousands of dollars. It all depends on how much you wish to spend. Pictured below is a transceiver that we considered. UNFORTUNATELY it turned out that it wouldn't do our desired function. The one that we are presently considering is even simpler. You will notice, if you have looked at other Ham transceivers, that the transceiver that we have selected and which is pictured above, has very few knobs, buttons, meters, dohickys and so forth compared to the others. Compare it to Greg's rig pictured here. Look at the center of the desk, then at the left of the desk, and down below the desk on the left. Scary! Unless you are a Ham hobbyist you really don't want to have to learn how to twiddle all those knobs. Simplicity is as simplicity does - and this is why while the SAFE Net transceiver will work on only one channel - it will do what we need it to do. Obviously, for $200 we are not going to be able to do what Hams do with rigs costing thousands of dollars. On the other hand - we are not really wanting to do the things listed under "The Goals of Ham Hobbyists" - and we will be able to do the things that we need to do. Our main desire for 'simple' was to assure that the SAFE members would be able to use it reliably . Simplicity also positively lowers cost and increases dependability. The things that will determine the high reliablity of our system are such as our limiting ourselves to one dependable channel, choosing simple and proven software, and establishing operating procedures suitable to our purpose. By the latter I mean that people won't be searching all over the band(s) as hobbyists do - for someone to talk to. We will have scheduled frequencies that specific people around you will use at specific times. In this way the probability is very great of being able to estasblish reliable communication. Dependability is a somewhat different issue than reliability. While simplicity helps assure reliability there are serious considerations that we have to take into account that others don't who are not preparing for the situation for which we are preparing. For example, protection from EMP, expectation that the earth's radio reflecting areas may be affected, and the availability of spare and supporting parts 'afterwards'. I won't go into detail at this point but we have given these subjects and others considerable thought and are making preparations for such things. Because of the situation that we are talking about using SAFE Ham Net radio system in - it will probably be the case that you won't have a working power outlet in your house to plug your desktop computer into. But not to worry. There are probably going to be lots of car batteries around - in non-working cars. The proposed radio itself, won't take much energy - and it will run directily off a car battery like this one. In fact the battery doesn't need to be nearly this big. 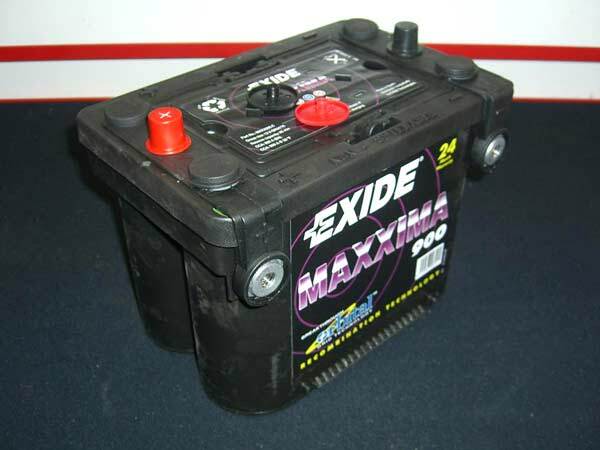 A motorcycle battery or any good 12v battery will do. More critical will be the challenge to keep the batteries charged. If the cars are working - then you will be able to charge the batteries - after you use them - even if the roads are such that there is nowhere to go (if you did have the gas). and you will probably be able to find enough gas in non-operating cars - to keep the batteries charged. If you are going to use a computer that presently runs on an outlet in your house - then to use a car battery to run it - you will need an inverter. Check the Internet - and you will find them for $13 up. You should find something suitable locally - (ahead of time) for well under $80. pictured here is under $40. 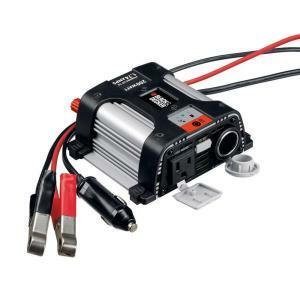 Notice that it has a continuous power rating of 150 Watts and a peak power rating of 300 watts. Whatever you get you will have to match to what your computer, hard drive, and monitor draw. This one has connectors both to plug into a car cigarette lighter - or clips to hook directly onto the battery. Other ideas for sources of power would be solar cells. But power is power - and if you have it you can probably find a way to convert it to your needs. 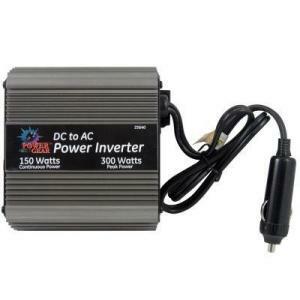 Power Inverters are handy things to have. You may have one already, for some other purpose. Just make sure that it matches the power requirements of your computer. You will also need an antenna. This is something else that you should get the materials for locally - ahead of time. Most any kind of good solid wire will do. We saw some 100 ft spools down at the hardware store for $2 a spool. You would need two - and that means your antenna would cost four dollars. If you get the two 100 foot spools - you will only use 60 feet off each one of them, but you need 60 foot pieces of continuous unbroken wire. You can also buy commercial antennas that are considerably shorter and I hope to add here in the future - further antenna information. You also need a connecting wire. Do you remember that old brown flat wire - with one lead on each side of it - that you used to use to hook up the TV to the antenna? That is exactly what you need. Or, better yet, some 75 Ohm Coaxial cable as shown in the drawing, and which is like what is used to hook many TVs. The drawing also shows insulators. Those are necessary - but can be made out of plastic or glass bottles - or something. It might be nice to have something like turnbuckles to put in between the end insulators and the trees, in order to take up the slack. I say trees, because you can just string this in between a couple of trees or the corner of some buildings - or any old thing rather than poles so long as they are at least 120 feet apart. The antenna does not have to be extended out in a straight line. It can have more than one dog leg. It is good to have the drop line as close to you transmitter as you can. This is a non-directional antenna - so laying the two leads out in any direction - will probably work just as well but you want the antenna to be between 8 and 16 feet above the ground. Twelve feet would be ideal. The antenna may work nearer to the ground than 8 feet - but not so well, and below 8 feet there is the possibility of someone touching it and getting burnt. Some radio waves travel in a straight-line or what we call line of sight or perhaps in a 'ground wave'. Others bounce off various bands or strata in the stratosphere depending upon their frequency. We have give much careful thought as to the choice of frequency, the type of signal to send, and the construction of the antenna to meet our needs of simplicity, low cost and dependability. The chosen design will be able to reliably broadcast and receive out several hundred miles. It will also be able, depending upon such things as weather conditions, be able to oftentimes send and receive at much greater distances. However, using the net and employing nodes that have greater capacity for relaying - we should have reliable communication over great distances. Technical Details of the SAFE Ham System. I have copied much of the wording of the text in this box from sources like Wikipedia. Don't worry if you don't understand one word in this box. Consider it to be just info that has been put in for Ham geeks. 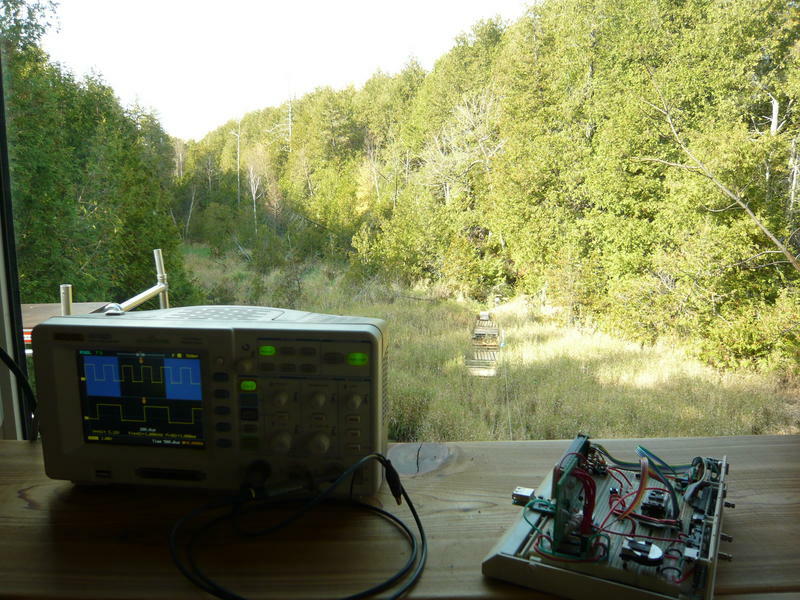 The SAFE Ham Net System is based upon PSK31 (Phase Shift Key, 31Baud) which has changed the nature of communications over ham radio and which has attracted thousands of hams to use this as their main mode of operation. PSK31 is extremely efficient of operating bandwidth use, typically requiring about 60 Hz for the signal. Signal separation of 100 Hz without interference is common practice. The nature of the PSK31 modulation system is such that it is effectively a two-tone modulation system. Because of this, good linearity must be provided through the audio path to prevent unwanted side bands from being created by the system. The MARVEL that makes all this work - is your computer and software. It is because many of the functions of the radio are performed by your computer - that you don't have to buy an expensive radio. b. translates the message that is received in the Morse like code - into text that you can read and save in a computer file. The computer does all this digitally and sends and receives the signal digitally. 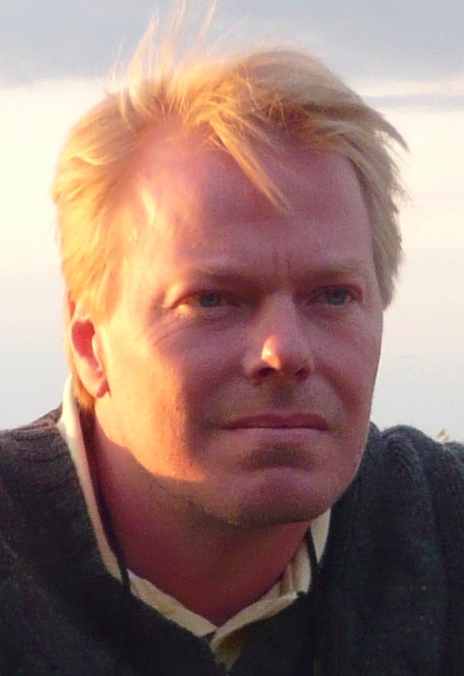 Consequently, through the new software and coding techniques there is a great degree of error correction and reliability built into the signal that wouldn't be there otherwise. You can read all about this but it is not necessary that you understand the technical details of what makes it possible for you to use the efficiency of Morse Code as to reliability and distance - without actually having to learn it. and you don't even have to have a radio! First click here to watch a video!!!. It is all very simple. In application you would be able to see the messages from many SAFE members around you and conversely one SAFE member may have his message read simultaneously by many other SAFE members. It would probably be the case that many more members would be watching than would be transmitting at any given time. Across the band there are many specific frequencies and a convention can be set up in any area that certain people will transmit on certain frequencies and at specific times. In this way the probability of reliable communication is greatly enhanced. Most of the demos are what I consider the usual boring Ham dialog - "I hear you - do you hear me?" But anyway - you can see how it works and how we can use it for the SAFE Ham Net. The baud rate being actually 31.25 means that works out to about 50 words per minute or two hundred and fifty characters per minute. 4 minutes to send a thousand characters. Forty minutes to send 10,000 which is about the length of one of my newsletters. In other words it would take about forty minutes - to receive the newsletter - so it means that we aren't going to be sending something that long. The answer is - to send very important info - and to use a lot of abbreviations. One station can send - and lots of stations receive at the same time. It is taking us much longer to develop the system than we imagined it would but we are also making further improvements as we go along. We hope that one of those improvements is an improved and even more simplified software system, but more about that if and when we make some actual progress on it. The above is an example of what a Digipan screen may look like on your computer. You are able to reconfigure it in some ways if you wish but this is pretty normal. In the top yellow area the messages of the selected conversation are appearing. In this case the messages are the usual chatter between Hams about their equipment, clubs, etc. but on the SAFE Ham Net it would be essential and critical information in the time of Catastrophe. The selected conversation came from what is called the "waterfall" at the bottom of the screen and was selected by putting the computer cursor over the 'red' stream. In this case there are only a couple of red streams on the screen but there could in practice be dozens to choose from. The point being - that all one has to do is to put their cursor over a stream - and the computer does the rest. It is that simple. What we are talking about - is a simple system that hooks directly onto your desktop computer. It can even be hooked onto a battery powered laptop or some have suggested a notebook. The transceiver that we are talking about is even much smaller than the one pictured here. You can pack the whole thing into a briefcase - or small suitcase. Even the antenna. In this picture notice the antenna strung up in the corner. If you don't have a laptop - you don't have to go out and buy one. 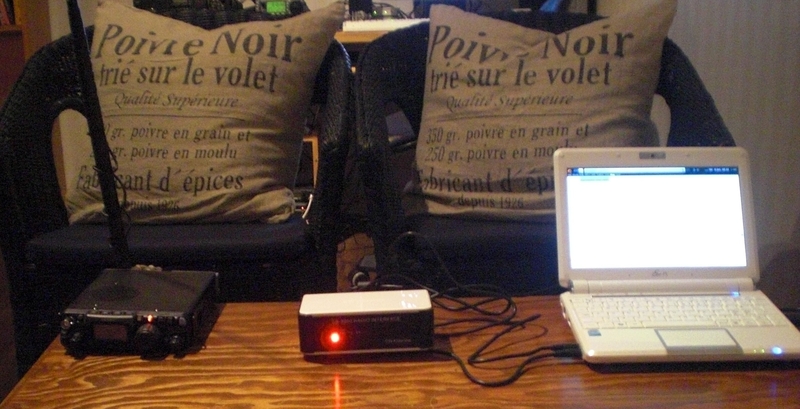 You can use the SAFE Ham system with your regular desktop but with a smaller computer it would be convenient to take it with you if you had to move. While I haven't mentioned it - and won't be emphasizing it - you can use a set of headphones and a microphone to talk over the radio we are selecting. In fact these are useful, and perhaps necessary, in setting up your station. However, we plan to mainly send text messages back and forth just like you were using email on your computer. You just have to be on-line at the time to send and receive. There are available free additions to the system that allow the messages to be stored for when you wish to pick them up - but that requires a computer server somewhere and we are planning to stay more simple. to show how beautiful, simple and portable the system can be. smaller than the smallest one shown here. Ark Two will monitor the band (note singular) appropriate to propagation conditions at the time. If possible, Ark Two will TX an SSB or CW beacon on an appropriate band so others can find us. We will ID as ARK TWO. 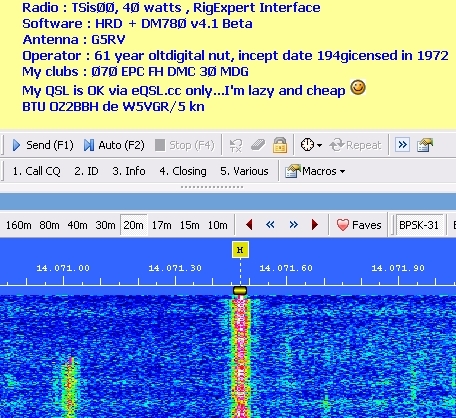 Reply on beacon frequency in SSB or CW when our carrier drops. Generally, 40 meters is a good daytime band until perhaps 4PM, and then 75 meters picks up. 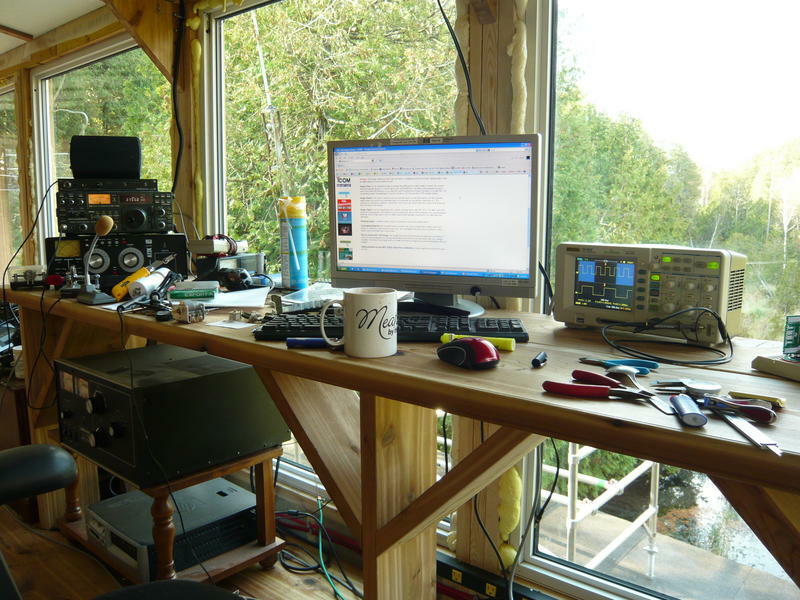 20 meters is a long-range band used for long haul, and counts on bouncing off the ionosphere and reflecting back, as does most amateur communication. The operator must understand propagation and skip, the factors that affect them, and know how to select the proper band based on numerous factors. 10 meters and 15 meters are the bands most affected by the eleven-year sunspot cycle. We are about 18 months from the bottom of the cycle, which is the most difficult times, in about 6 years we'll be at the peak of the next cycle, and the higher frequency bands will work. Now it's very rare to be able to make other than very local contacts on 10 and 15 meters, and this will only get worse until the sunspot cycle picks up. When it does get near peak, though, small amounts of power can talk around the world with simple antennas. The above are the type of reasons that we are mentioning "appropriate to propagation conditions". There may be other conditions caused by EMP, widespread nuclear activity, and earth changes. Whatever, we will be looking for people calling the tactical sign ARK TWO, and the call sign that we respond with will depend upon which of our HAM radio operators are present - providing that is relevant.